The hospital in Frydek...beauty salon in Poland...pediatrician in Frydlant...favorite cafe in Frydek...vet in Frydlant. All places I've spent time in this week. It all looks and feels so normal to me, you know? I've lived here 17 years now...and well, it's just normal! But every once in a while I step outside myself and think about what it looks like to someone who's never seen it. Such as the waiting room in the "lung building" at the hospital...wish I'd had my camera while I was in the waiting room! 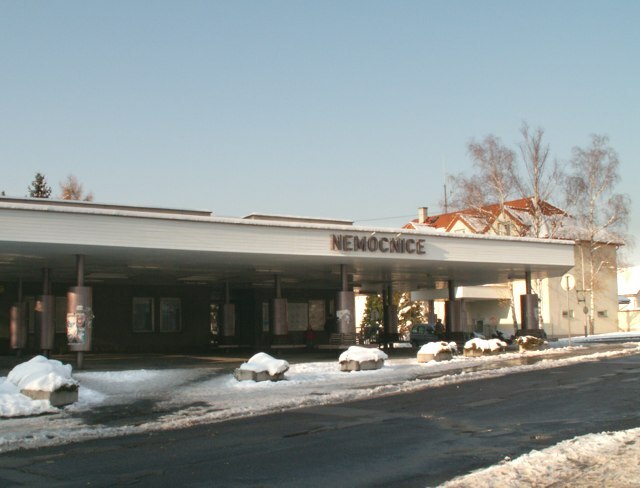 The picture above is just around the corner, at the entrance to the hospital (Hospital=Nemocnice). I spent almost two hours there today, waiting for Caleb to get some testing done regarding his asthma. That waiting room was seriously no bigger than my guest bathroom...and it's not very big! The seats were hard as rocks, the walls were plastered with signs in Czech, saying everything from "Have you decided to quit smoking?" to "Hospital stays 60 Kc per day" (that's about $3!). And there was a steady stream of interesting (and I mean that in the way you say "interesting" when you don't know how else to politely describe someone!) people wandering in and out, as well as an ambulance delivering people to their doctor appointments every 15 minutes or so (they do that here). And it was normal. I read a book most of the time, hardly looking up, except when the thought crossed my mind about what it would look like if you were here seeing it! Yesterday I was at the beauty salon in Poland, babysitting my friend's 8 month old daughter for three hours while she got her hair done. 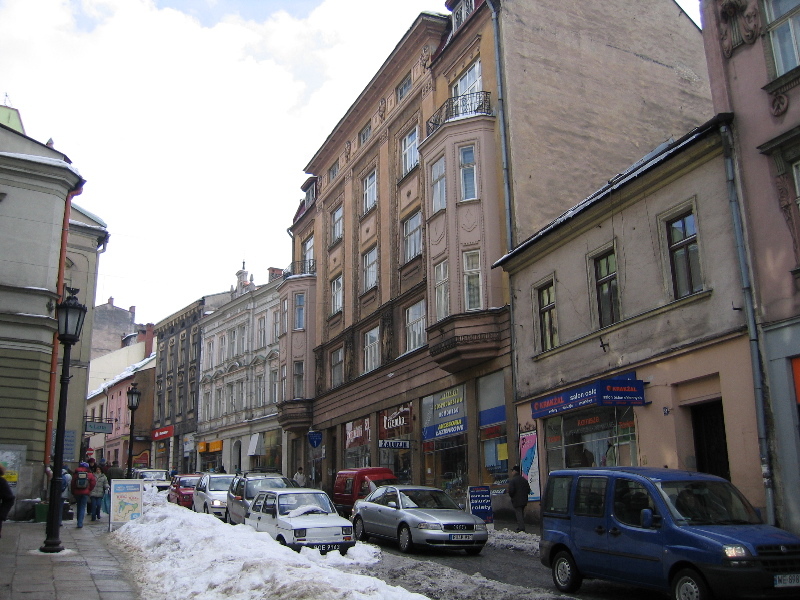 I walked her in her stroller (think, big baby buggy) for an hour and a half, through the streets of Polsky Cieszyn while she napped. Then I entertained her in the salon by wandering around looking at the nail artist lady working in the other room, the glamor photographer shooting in another, and the make-up artist room down the hall...yep, they're all in the salon along with the hairdressers. We even visited the restroom...where there's a two person tub. Maybe that's normal where you live...I don't know. Today I was in Frydek-Mistek, the bigger city (80,000 people) near where we live, having coffee and apple strudel with my friend, Sharon. It's the best strudel I've ever had...even if I can't eat the (glutenous) dough around it! I always say I'm going there for coffee and "studel insides"! I happened to have my little camera with me but forgot to take one of the strudel, so here's our espresso...and yes, that's a "side" of whipped cream! Earlier this week I was at the pediatrician with Claire. You don't make appointments with most doctors here. You just show up and keep track of who was there when you arrived so you know when it's your turn to go in. I would say 99% of the time, people adhere to the "who was here first" unspoken rule. It took about 45 minutes to get in to see the doctor. Even though we arrived at 8 AM, which is when she opens, there were already 5 people ahead of us waiting to see her too. Oh, and another thing about that waiting room, like most Czech waiting rooms? It's almost silent...whispers only, unless there's a baby making noise. Moms are always "shushing" their children to be quiet. This is a very quiet country! No waiting line at the vet...not even much of a waiting room to speak of as you almost never have to wait to be seen. I love our vet. It's fast, it's easy, it's pleasant...for me anyway! It's been a good week, doing normal things in normal places! And I love picturing so many of the places you talked about here. It wasn't so long ago I went to some of these same streets, which is so fun to really be able to picture your life as you live it! Love ya! It is so cool to see you feature some of the "regular" places that you go that seem so normal to you but appear very "foreign" to the rest of us who don't live in Czech!